Of all the books I have on pre-order, the one I am most excited about is STRANGE WEATHER. Not only did I enjoy the read, I think it will be pretty cool to have it separated into four volumes. Do you have any thoughts on when you might be in a position to show pictures or share some of the final artwork? "When I have a little money, I buy books; and if I have any left, I buy food and clothes." Send PS an email. They have a standing order with us, so they typically get a handful of all of our books. Oh cool! I went to their website, just in case, but didn't see anything ! We're still waiting on the final artist, but I'd like to have the four book covers ready to show off not long after he is done! Answer Guy from Cemetery Dance Publications! Please always free free to Email Me if there's anything I can help with! I'm highly anticipating this title as well. Brian, does the books have more artwork besides the DJ? We're extremely happy to report we'll be publishing This Dark Chest of Wonders: 40 Years of Stephen King's The Stand by Andy Burns! This very special volume tells the story behind the story of King's enduring opus and delves deep into its various incarnations — the unfilmed George A. Romero adaptation; the 1994 ABC mini-series; the audiobook; and Marvel Comics' adaptation. Included are exclusive interviews with Stephen King experts Bev Vincent, Robin Furth, Mick Garris, Jamey Sheridan, WG Snuffy Walden, Grover Gardner, Ralph Macchio, Roberto Aguirre-Sacasa and Mike Perkins. 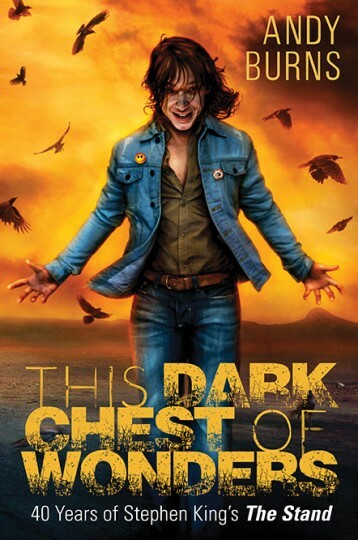 This Dark Chest of Wonders: 40 Years of Stephen King's The Stand delivers a complete and uncut look into one of Stephen King's most enduring achievements. PLEASE NOTE: This title is already 80% SOLD OUT and these remaining copies will go FAST, so please do not wait to place your order! There's nothing we can do for you once they're all reserved! I went back through my old email and found the interview. Once I started reading, I had a better recollection of it! Hey Brian, can I make a small request? I like the CD t-shirts that you have been offering them more, but could we possible have a color choice other than black? My t-shirt drawer is beginning to look like that of a teenage goth girl! GOOD news, everyone! Our next shirt will be available in dark OR slightly darker black, to appeal to a wider audience. Great question! I'll have to find out because I actually cannot remember at this point. My brain has turned to mush in this weird summer weather we're having! ...OR slightly darker black, to appeal to a wider audience. Brian any rough plans for Fright or Flight Lettered release? Hello Dan, I sent a message to PS and they were supposed to check, but the books I am interested in doesnt seem to be among the ones they are getting. Shoot me an email I'll check. I don't remember PS passing on anything lately. Received The Washingtonians yesterday! Very cool book and one of my fave Masters of Horror episodes! We need more Bentley Little brought to the screen! Usher's Passing is a great choice. That should be a big seller. Yeah, I just listened to it on audio. Really creepy and entertaining novel. I've also preordered the S/L from CD. FYI, Team CD. On the production updates page the Malerman book links back to a different book.